These include Manta Reef, Two-Mile Reef, Vengies, Rainbow Runner Reef, and the Greek Temple, as well as the waters off Inhambane, filled with pristine reefs, manta rays, and whale sharks. 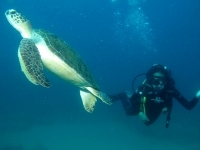 In the south, Ponta d'Ouro has a number of world-class dive spots. Ponta d'Ouro is easily accessible from South Africa, an advantage for those whipping across the border for a few underwater adventures. Inhaca Island is another popular destination with extensive coral reefs, as is Tofo in the southeast of the country. Mozambique's waters are home to some fascinating sea creatures which divers are most likely to encounter between April and July. Although possible all year round, diving is best during the winter months between May and September, with fewer storms, less wind, and a weaker current allowing increased visibility. Winter visitors may even experience a close-up encounter with the migrating humpback whales. Mozambique is essentially one of the best diving destinations in the world, with plenty of schools and resorts offering dive courses and equipment for hire, and dive sites to suit all levels of expertise and experience.